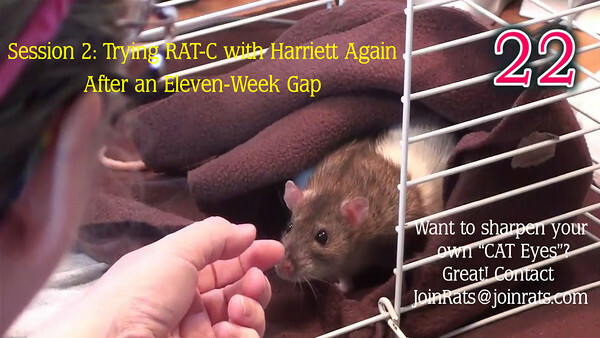 If you want to jump to the key video example on this page, it is the last video on this page, entitled, "Session 2: Trying RAT-C with Harriett Again After an Eleven-Week Gap." This series of videos has been done by a non-professional. Gwen is not trained in behavior analysis, behavior modification, or the science of learning methods. She is a pet rat lover who loves to dialogue about helping to socialize shy pet rats. 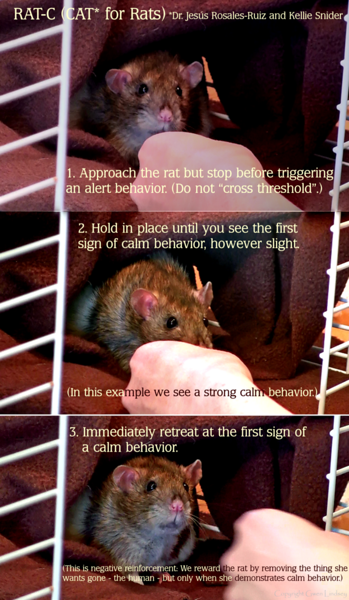 Humans who love rats tend to use intuitive and/or commonly known techniques to help a frightened rat, such as sitting quieting nearby, offering treats, and bringing the rat closer (such as down inside one’s shirt) until she "learns" to some extent that she can trust her human. Gwen has used such techniques on her rats and she felt they were well-socialized. Many such techniques can be found on the JoinRats site. However, there is a relatively new, cutting-edge, behaviorally sound and scientific method for working with fear-aggressive dogs, feral cats, and wild horses (and is expanding to many animal species) that takes a fresh and very different approach. This method is known to help seriously fearful or aggressive animals do a significant turnaround to friendly, where other methods succeeded only partially or could not produce reliable behaviors. 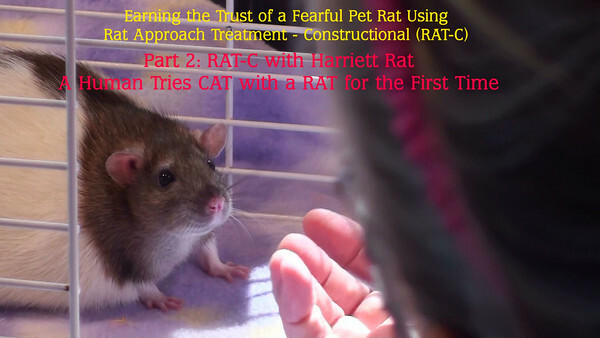 This method – which has not yet been tried in any systematic fashion for pet rats – is Constructional Aggression Treatment (CAT). See below for more details on the terms and authorship. Why should pet rat lovers be interested in this technique? It holds the promise of helping fearful or aggressive rats in a profound way. The technique gives the animal a sense of empowerment and safety where she may be feeling frightened or overwhelmed, or where she may have come from an abusive environment and be carrying much “baggage” about humans. Constructional Aggression Treatment (CAT) is a behavioral modification technique conceptualized and applied by Dr. Jesús Rosales-Ruiz and Kellie Snider of the Behavior Analysis Department of the University of North Texas. CAT was initially applied to fear-aggressive dogs. 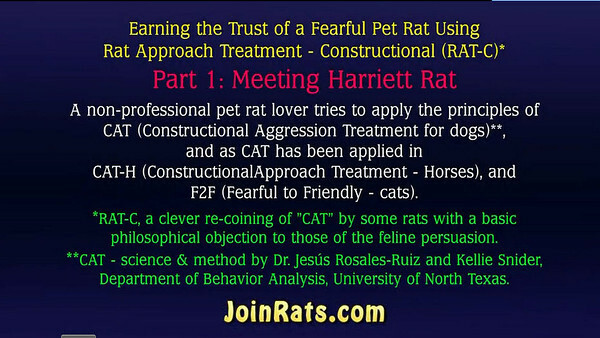 The method was then applied to feral cats through the Fearful to Friendly (F2F) technique by Dr. Jesús Rosales-Ruiz and Angela Drake Rentfro, and to horses as the Constructional Approach Treatment-Horses technique by a group of horse trainers (originating author of the CAT-H term is unknown) working with the guidance of Dr. Rosales-Ruiz. 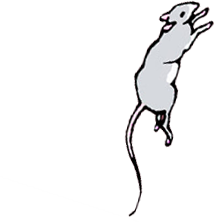 Gwen's rats, who understandably object to giving felines so much attention, even if unintended, coined the application of this technique to rats, RAT-C, Rat Approach Treatment-Constructional. Harriett Rat bravely assisted an untrained human in exploring the technique. Three frames from a RAT-C session with Harriett, which show: 1. Human approaches but stops before triggering any additional alert behavior. (Human should not cross threshold.) 2. Harriett decides to respond with a very strong calm behavior of reaching toward the hand. (Important: even tiny, subtle, flickering signs of calm behavior are rewarded in CAT.) 3. Human rewards her by retreating. This sums up the CAT (Constructional Aggression Treatment) method, showing how it works with a rat. This method uses negative reinforcement: We would like calm behavior to increase (be reinforced). Harriett considers removal of the human to be a reward - this is something she desires. So when Harriett demonstrates a calm behavior, the human takes herself away, which is the aspect of negative (taking something away, out, as in mathematically subtracting). Negative reinforcement. Reward the rat by giving her the thing she wants: take away the human. Because we remove the human when Harriett demonstrates calm behavior, we reinforce her calm behavior. Meaning she will become more calm over time. CAT professionals talk about how the animal reaches a switch-over point, where the fearful behaviors become intrinsically friendly. To me it is awesome that we could help a frightened rat by removing ourselves, which the rat experiences as a reward, and in the end we have a friendly rat who will seek us out positively. Session 1, Part 2: Gwen tries and fails to do RAT-C correctly. This is the only video in this set that contains attempts to do RAT-C (CAT). The human has to approach and retreat from the rat timed exactly, precisely at the tiniest of calm behaviors - just the flicker of an ear, for example. Gwen had to roll her eyes on viewing this video, and said to herself, "What were you waiting for, Gwen, for Harriett to fall asleep before you retreated?" What a learning experience! Becoming observant and responsive to a rat's body language is intensely focused and yet has the potential to be extraordinarily rewarding for both human and rat. Session 1, Part 1: Preliminary to trying RAT-C (CAT). Observing Harriett and offering treats. Whether a rat will take a treat from a human, and how she interacts with the treat and fingers, can often say a lot about the fear state of a rat.